Bad Blue Heron is yet another Noodler's ink with a quirky name. 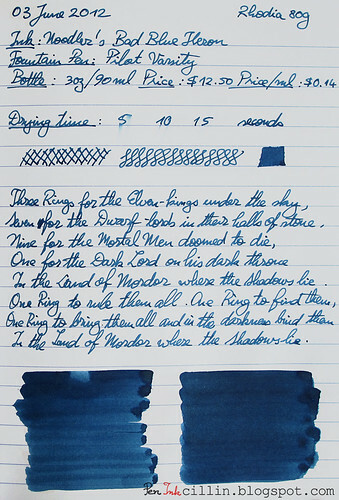 This particular ink belongs to the Warden series, which features extremely high resistance to forgery techniques and substances. This is always good to have, as a feature, because there aren't very many ink manufacturers who make waterproof inks. In what has become somewhat of a tradition for me these days, I tested a sample of Noodler's Bad Blue Heron (which lasts me about 2-3 weeks) in my trusty Pilot Varsity. I'm still searching for the perfect ink so let's find out together if this is the one. I really didn't know what to expect before I used this ink but I was pleasantly surprised. What took me aback was a compliment I received on the ink's color from someone who doesn't know a thing about fountain pens and inks. That's a good start isn't it? But on with the review. Bad Blue Heron comes in Noodler's classic plain bottles of 3oz/89ml capacity. The cost is the usual $12.50 per bottle, or $0.14 per milliliter. This tells me that the components which make up this ink are nothing out of the ordinary. Bad Blue Heron is, as the name suggests, a blue ink. Yet, many folks classify it as blue-black and I would partially agree with them. In all honesty, I haven't used many blue-black inks. This is the only one in recent memory. As such, the color is still blue to me. Now, mind you, it is a very somber blue, not very saturated, quiet subdued in fact. Think of worn jeans. Something like that. The fact that it received a compliment from a non-enthusiast, says a lot about it. Me, I like it a lot. Bad Blue Heron doesn't have any shading. Here's, perhaps, the only negative I can find. Waterproof inks tend to be pretentious in terms of paper and this one is no exception. While it doesn't bleed outright, it does ghost a little on photocopy paper. There are no issues on high quality paper such as Rhodia, though. But don't let this scare you away. I've been using it for the past two weeks daily at work, on the cheapest photocopy paper you can find, and both sides are eminently writable, even if you can see shadows from the reverse. One of the things I like best about Bad Blue Heron is the flow. On a 1-10 scale I would rate it at least a 7, if not 8. I just love a wet ink and this one makes me feel warm inside when I use it. 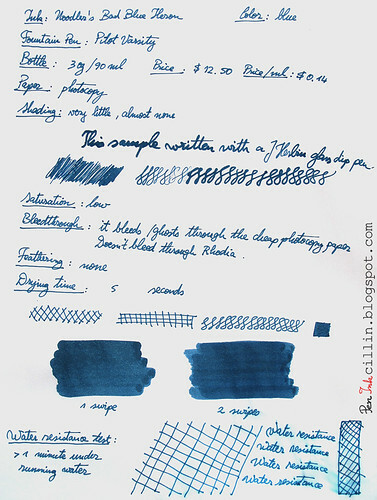 Maybe the Pilot Varsity also helps here but compared to other inks this is one of the best flowing I have tested. Another aspect that I like is how it glides across the paper (even cheap paper). It almost feels like I have WD40 smeared on my nib. Does this mean that it is very well lubricated? Perhaps. I've always had trouble determining how lubricated an ink is. Let me know if I'm using the term correctly. Noodler's Bad Blue Heron doesn't miss a beat as far as drying times are concerned. On photocopy paper it dries in 5 seconds or less, while on the shinier Rhodia 80g it needs a little longer, between 5 and 10 seconds. This is better than most inks so it gets top marks from me. I did mention this ink is forge-resistant, didn't I? A minute under running water didn't phase it a bit, except that it shed a little color, as you can see from the sample below. That's not a big deal to me. Noodler's Bad Blue Heron comes really close to the perfect blue ink for me. I can almost say that my search is over. Of course, there are myriads of blue inks left to test but I'll be surprised if I find one that beats Bad Blue Heron in all aspects. It offers a pleasantly subdued but professional color. It flows really well and doesn't feather. It dries quickly and doesn't smear when dry. Though it may ghost/bleed a little on cheap paper, it fully makes up for that with its high water resistance. To top it all, the price is the lowest of all inks. What is there not to like about it? In fairness, there are a couple of minor quibbles that might hold you back. It has a faint chemical smell but to me it isn't at all unpleasant. It also tends to stain plastic and the vial it came in was tricky to clean. Rubbing alcohol managed to clean it very well. I'm curious to see how well I can clean the Varsity after I'm done with it but I would test it in a cheaper pen before using it in an expensive fountain pen. Well, that's it then. Noodler's Bad Blue Heron is, in my opinion, a winner. Please let me know if you agree or disagree. I will now leave you with the two samples done on photocopy and Rhodia 80g. Noodlers Bad Blue Heron is one of my go-to colors! I find it very handy for addressing envelopes, writing postcards, or doing any kind of writing. Should you ever find the dry time too lengthy just add a drop or 2 of (distilled) water *per fill* and that should end the problem. Very nice review! I have to say, for me, I don't like BBH much. I found it to flow too generously, but I also found it dried out easily and left precipitate. I am a big fan of R and K Salix, a blue-black iron gall ink that is extremely well behaved, and also a very interesting color. Also waterproof. Well there's bound to be someone who doesn't like this ink but that's ok :) As far as I'm concerned, there's no such thing as a "too generous flow". I like my pens to write wet but very often the pen can't deliver so you turn to the ink. You can, of course, increase the flow of the ink by fiddling with the feed but I try to stay away from that. Also, iron gall sounds dangerous. I'm sure modern iron gall inks aren't as corrosive as in the past but I have an instinctive wariness of them. Oh but the dry time is excellent, I wouldn't change a thing. P.S. You posted the same comment twice, I deleted the second one for you. All the inks for fountain pens seem to be water based. Are their inks out there that are waterproof? If so please share some. Are you saying in general? There are many waterproof inks though not many manufacturers of waterproof inks. Bad Blue Heron is waterproof. Noodler's makes many waterproof inks. Private Reserve also makes a couple.